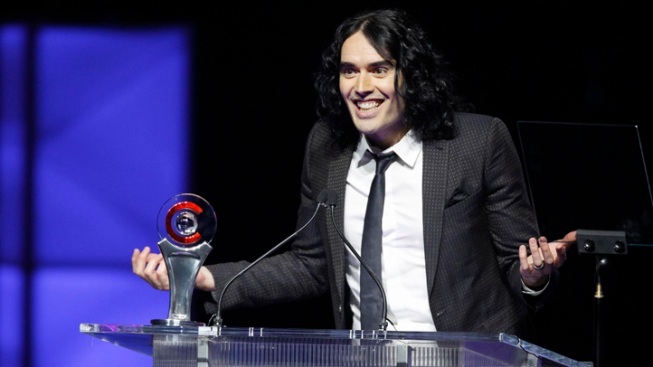 Actor Russell Brand, shown here accepting an award during CinemaCon, is in hot water for reportedly throwing a photographer's iPhone through a window. Russell Brand turned himself into New Orleans police Thursday after a misdemeanor warrant was issued for his arrest. The charge? Simple criminal damage to property valued at $700, authorities said — or, according to E! Online, grabbing a paparazzo's iPhone and hurling it through a nearby office window. Brand posted bond and was released from jail Thursday afternoon, said police spokesman Frank Robertson. Bond had been set at $5,000, he said. The actor also faces a fine of $700 for criminal damage. Police issued the warrant earlier Thursday for Brand, who is in New Orleans to film an untitled movie. According to U.K.'s Daily Mail, the photographer, Timothy Jackson, began to take pictures of the “Get Him To The Greek” star with his iPhone from his car. Brand lost his temper and grabbed Jackson's phone, the photographer said. Brand's representatives said the actor will pay for the damaged window, TMZ reported. No word on whether he'll replace the iPhone.